These pages are devoted to H.P. 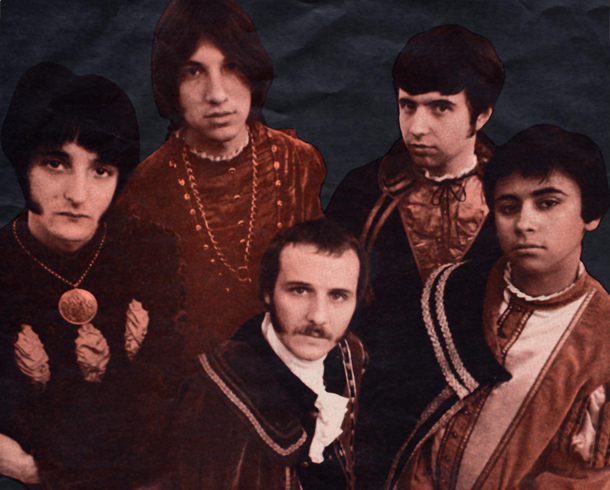 Lovecraft, a great psychedelic band formed in Chicago in 1967 and disbanded in 1969 in San Francisco. The original band lineup released two studio albums: H.P. Lovecraft (1967) and H.P. Lovecraft II (1968). A brilliant live performance recorded at The Fillmore West was released on CD and vinyl in 1991, titled simply Live May 11, 1968. A spin-off group named 'Lovecraft' released two additional albums in the 1970's to lesser acclaim. H.P. Lovecraft's unique sound comprised the haunting vocal harmonies of George Edwards and David Michaels with the rock-solid musicianship of guitarist Tony Cavallari, bassists Jerry McGeorge and Jeffrey Boyan, and drummer Mike Tegza. At their pinnacle in 1969, their live act was on par with (and sometimes bested) top-billed bands they appeared with, including The Grateful Dead, Jefferson Airplane, Pink Floyd, Traffic, and The Who. This site features an in-depth biography of the band written by journalist Nick Warburton. I am very grateful for his permission to republish his work here. This site is also based on the work of Krister Nyland, who graciously allowed me to reproduce his content from a previous site. I would appreciate any materials you may have that would further enhance this website. You can reach me at info@thewhiteship.org.